Fast, reliable broadband for local homes and businesses is not a luxury, it is essential for our ever-growing businesses and for those in isolated villages to remain connected. Broadband has been an issue that has plagued West Oxfordshire for many years, with disparate levels of service across our area. I have campaigned ceaselessly on this issue, raising it repeatedly with the Digital Minister. I am therefore delighted to welcome the announcement that West Oxfordshire District Council, in partnership with the Department for Culture, Media & Sport, will be able to connect more than 4,600 homes and businesses to ultrafast full fibre broadband by the end of 2019 right across West Oxfordshire - showing just what a strong local team can achieve. We’ve made some real progress on this issue, but we must keep up the pressure on BT, Broadband Delivery UK and all levels of government to secure 100% superfast broadband across West Oxfordshire. That means continuing the roll-out of high speed broadband for all homes, including those in hard-to-reach rural areas. Find out more information about when full fibre broadband is coming to your area here. Robert has attended Rural Vulnerability Day and picked up a copy of a report on rural services. 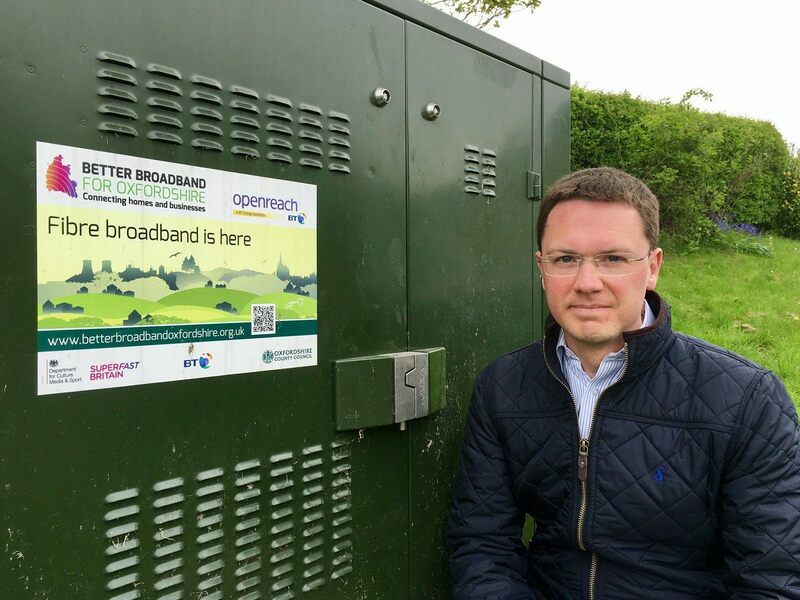 Robert said, "It is fantastic that in West Oxfordshire superfast broadband is being rolled out. Robert was delighted to join Gigaclear in Ducklington, where they are installing ultrafast broadband. In the House of Commons, Minister for Digital, Matt Hancock, congratulated Robert Courts MP's tireless work on getting increasing connectivity for rural areas. In the House of Commons, Minister for Digital, Matt Hancock, congratulated Robert Courts MP’s tireless work on getting increasing connectivity for rural areas. This survey is a great way for you to let me know about the quality of your broadband service. The information you provide will help me in my engagements with utility providers, regulators and the Government when tackling the issues of speed, quality and choice. So please do take a few moments to let me know about your broadband connection.